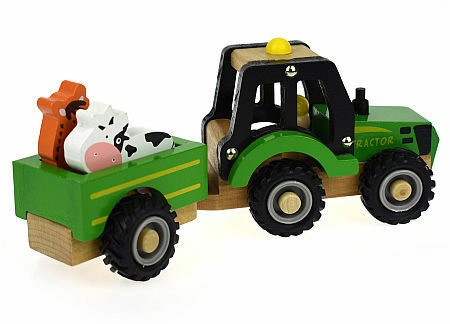 Wooden Toy Tractor Animal Trailer is a beautifully sturdy wooden toy with fantastic chunky rubber wheels. This Wooden Tractor is a lovely green and comes with a detachable trailer also with good strong rubber wheels. We like this because: "Fantastic interactive toy all ready for farm fun."